From concentrate with added ingredient. No artificial flavors. No added sweeteners. 2 servings of fruit (Each 8 fl oz serving of Essential Everyday 100% juice provides the equivalent of 1 cup of fruit. The USDA's MyPlate sets a serving of fruit to be equivalent to about 1/2 cup and recommends a daily intake of 2 cups of fruit for a 2,000 calorie diet) per 8 fl oz serving. 120% daily value vitamin C. 110 calories per 8 fl oz serving. Real savings. Highest quality. Every day. Great products at a price you'll love - that's Essential Everyday. Our goal is to provide the products your family wants, at a substantial savings versus comparable brands. We're so confident that you'll love Essential Everyday, we stand behind our products with a 100% satisfaction guarantee. Our fruits are carefully selected and picked at the peak of ripeness to ensure the freshest tasting juice possible. With no added sweeteners and no artificial flavors, Essential Everyday juice is pure taste enjoyment. 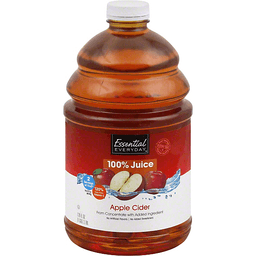 Just one serving of Essential Everyday 100% juice meets half your daily fruit needs (Each 8 fl oz serving of Essential Everyday 100% juice provides the equivalent of 1 cup of fruit. The USDA's MyPlate sets a serving of fruit to be equivalent to about 1/2 cup and recommends a daily intake of 2 cups of fruit for a 2,000 calorie diet). If you're not completely satisfied with this product, please contact us at www.essentialeveryday.com or 1-877-932-7948. Pasteurized. Contains 100% juice. Bottled in USA. 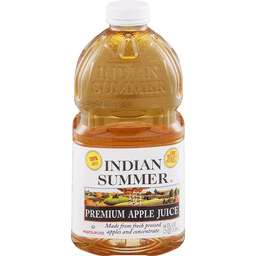 Indian Summer® Premium Apple Juice. 100% juice. 120% daily value vitamin C per serving. Made from fresh pressed apples and concentrate. Pasteurized. 64 fl oz (2 qt) 1.89 L. If you're not satisfied with the quality of this product or have questions or comments, please write to Indian summer. www.cherrycentral.com. 100% juice. 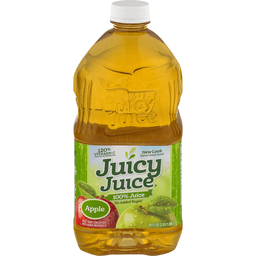 A blend of from concentrate & fresh pressed apple juice not from concentrate. American Masters of Taste: Gold - superior taste. 120% vitamin C per serving. Langers. It's in the juice. 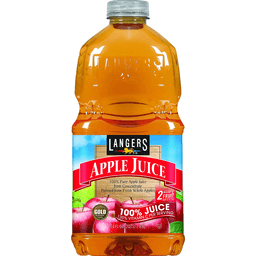 The Langer Story: Growing up in the '50s, we drank fresh juice every day. Dad was our head juicer and we were his official tasters. Together, we discovered which fruits made the best-tasting juices. Today our family keeps the same high standard. We taste every batch we make and the Langer name doesn't go on the label until we're satisfied the juice is perfect. That's why we're pleased to bring you our exclusive blend of 100% USA grown apples, including fresh-pressed, locally grown harvest favorites: gala, honey crisp and red delicious apples from the sundrenched Yakama Valley of Washington State, as well as tart granny smith and juicy fuji apples from California. It's 100% pure. With no preservatives, no added sugar and nothing artificial. The result is a juice like no other. Completely delicious and nutritious - just the way Dad taught us. Like us on Facebook. Family owned since 1960. No sugar, sweeteners or colors added. No preservatives. Very low sodium. GMO free. Gluten free. Pasteurized. Our bottles are BPA free. Please recycle. www.langers.com. 100% USA grown. Bottled in the USA. 120% vitamin C. Made from US apples. Pasteurized. If you're not satisfied with the quality of this product or have questions or comments, please write to Indian Summer, Traverse City, MI 49685. www.CherryCentral.com. PET is 100% recyclable. 100% juice. From concentrate. Sweetened with sucralose. Real savings. Highest quality. Every day. 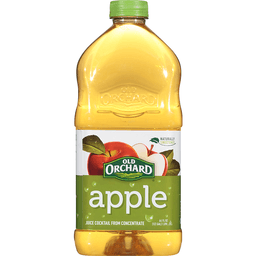 45% fewer calories than regular apple juice. 100% Daily Value vitamin C per 8 fl oz serving. Great products at a price you'll love - that's Essential Everyday. Our goal is to provide the products your family wants, at a substantial savings versus comparable brands. We're so confident that you'll love Essential Everyday, we stand behind our products with a 100% satisfaction guarantee. Essential Everyday Juice Cocktail uses fruit picked at the peak of ripeness and blends them for a crisp, refreshing taste. No artificial colors or flavors added, Essential Everyday Juice Cocktail is pure taste enjoyment. If you're not completely satisfied with this product, please contact us at www.essentialeveryday.com. Contains 50% juice. 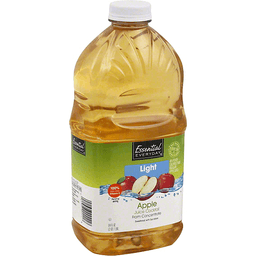 Light Apple Juice Cocktail: 60 calories and 14 grams of sugar per serving. 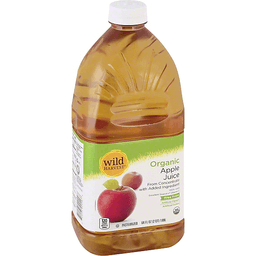 Regular Apple Juice: 110 calories and 28 grams of sugar per serving. Bottled in USA. From concentrate with added ingredient. No artificial flavors. No added sweeteners. 2 serving of fruit (Each 8 fl oz serving of Essential Everyday 100% Juice provides the equivalent of 1 cup of fruit. The USDA's MyPlate sets a serving of fruit to be equivalent to about 1/2 cup and recommends a daily intake of 2 cups of fruit for a 2,000 calorie diet) per 8 fl oz serving. Real savings, highest quality, every day. Great products at a price you'll love - that's Essential Everyday. Our goal is to provide the products your family wants, at a substantial savings versus comparable brands. We're so confident that you'll love Essential Everyday, we stand behind our products with a 100% satisfaction guarantee. Our fruits are carefully selected and picked at the peak of ripeness to ensure the freshest lasting juice possible. With no added sweeteners and no artificial flavors, Essential Everyday Juice is pure taste enjoyment. 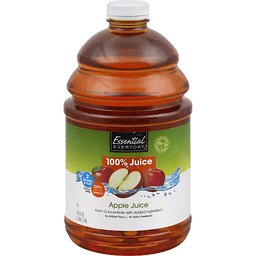 Just one serving of Essential Everyday 100% Juice meets half your daily fruit needs (Each 8 fl oz serving of Essential Everyday 100% Juice provides the equivalent of 1 cup of fruit. The USDA's MyPlate sets a serving of fruit to be equivalent to about 1/2 cup and recommends a daily intake of 2 cups of fruit for a 2,000 calorie diet). Contains 100% juice. Bottled in USA. Flavored juice cocktail blend from concentrate. Naturally sweetened. Naturally sweetened is naturally better! 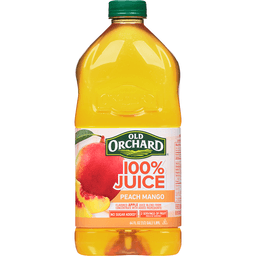 Old Orchard premium juice cocktails are naturally sweetened with stevia leaf extract and real sugar. They contain no artificial colors, flavors or preservatives. You'll taste the delicious difference in every sip! - Amy Bragagnini MS, RD, CSO. Ask Amy questions about diet and nutrition at oldorchard.com. This bottle contains 15% less PET resin, keeping 2 million pounds of plastic out of landfills. Contains 20% juice. Pasteurized. Naturally gluten free. We appreciate your comments and questions. To learn more about our products, please visit us at www.oldorchard.com or call. From organic concentrate with added ingredients. Non GMO Project verified. nongmoproject.org. USDA organic. Family owned. Deeply rooted. The seed for Old Orchard was planted in 1985 by fourth generation growers Mark and Lisa Saur. Our Sparta, Michigan-based company is still family-owned, but has grown into one of the nation's leading juice producers, offering over 100 different juice products. We hope you and your family will enjoy the fruits of our labor. Mark and Lisa Saur, founders. Contains 100% juice. Certified organic by Quality Assurance International. Quality Assurance International: Certified organic. We appreciate your comments and questions. To learn more about our products, please visit us at www.oldorchard.com or call 1-800-330-2173. Pasteurized. Naturally gluten free. This bottle is BPA free. From concentrate with added ingredients. No artificial flavors. No added sweeteners. 2 servings of fruit (each 8 fl oz serving of Essential Everyday 100% Juice provides the equivalent of 1 cup of fruit. The USDA's MyPlate sets a serving of fruit to be equivalent to about 1/2 cup and recommends a Daily Intake of 2 cups of fruit for a 2,000 calorie diet) per 8 fl oz serving. 120% Daily Value vitamin C. Real savings, highest quality, every day. Great product at a price you'll love - that's Essential Everyday. Our goal is to provide the products your family wants, at a substantial savings versus comparable brands. We're so confident that you'll love Essential Everyday, we stand behind our products with a 100% satisfaction guarantee. Our fruits are carefully selected and picked at the peak of ripeness to ensure the freshest tasting juice possible. With no added sweeteners and no artificial flavors, Essential Everyday Juice is pure taste enjoyment. 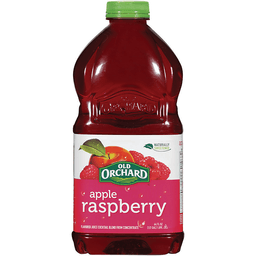 Just one serving of Essential Everyday 100% Juice meets half your daily fruit needs each 8 fl oz serving of Essential Everyday 100% Juice provides the equivalent of 1 cup of fruit. The USDA's MyPlate sets a serving of fruit to be equivalent to about 1/2 cup and recommends a Daily Intake of 2 cups of fruit for a 2,000 calorie diet). Contains 100% juice. Bottled in USA. 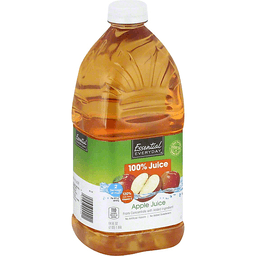 Flavored apple juice blend from concentrate with added ingredients. No sugar added (See nutrition information for calorie and sugar content. Not a low calorie food). 2 servings of fruit per 8 oz serving (4 oz of 100% juice equals one serving of fruit per USDA's Dietary Guidelines. These guidelines recommend that you get the majority of your daily fruit servings from whole fruit). Healthy drinks help balance your diet! The vitamins and nutrients we get from fruit add to the benefits of an overall healthy diet. 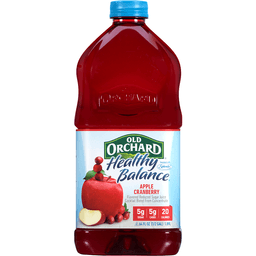 The Old Orchard 100% juice blends taste great with no added sugar, and have two servings of fruit in each 8 ounce serving (4 oz of 100% juice equals one serving of fruit per USDA's Dietary Guidelines. These guidelines recommend that you get the majority of your daily fruit servings from whole fruit). - Amy Bragagnini MS, RD, CSO. Contains 100% juice. We appreciate your comments and questions. To learn more about our products, please visit us at www.oldorchard.com or call 1-800-330-2173. Pasteurized. Naturally gluten free. This bottle is BPA free. 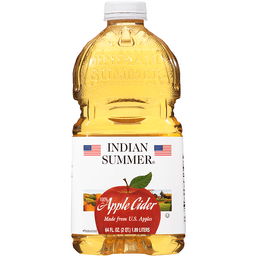 Indian Summer® 100% Apple Cider. Made from fresh apples. Not from concentrate. Pasteurized. 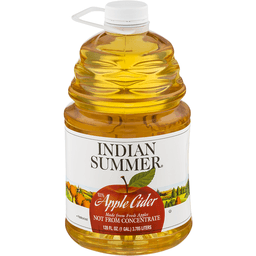 Indian Summer apple cider is made from 100% fresh pressed apples, not from concentrate. In the fall of each year our growers select only the best apples for our apple cider. You can count on Indian Summer to provide the taste of freshness in every bottle. P.E.T. is 100% recyclable. Contains 100% juice. If you're not satisfied with the quality of this product or have questions or comments. Please write to Indian Summer, Traverse City, MI 49685. www.cherrycentral.com. 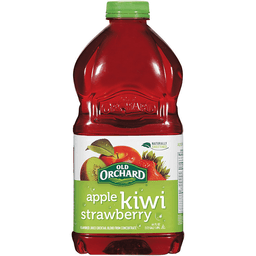 Reduced sugar juice blend drink from concentrate. 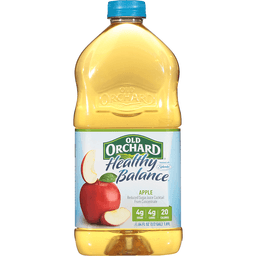 50% less sugar than 100% apple juice. 100% DV vitamin C. Contains 50% juice. Pasteurized. 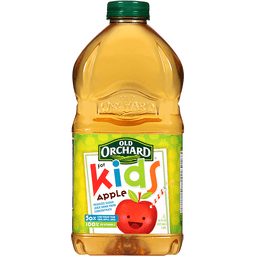 A+ for Good Nutrition: Kids of all ages love the great taste of Old Orchard for Kids Grape Drink. 50% less sugar. 100% vitamin C. No artificial flavors or colors. This drink has 14 g sugar. 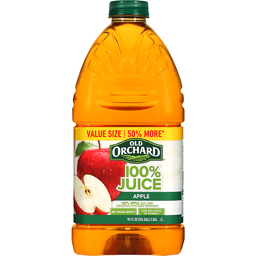 100% Apple Juice has 27 g sugar. For a free coloring book, visit OldOrchard.com/fun. We appreciate your comments and questions. To learn more about our products, please visit us at www.oldorchard.com or call 1-800-330-2173. Naturally gluten free. This bottle is BPA free. Please recycle after use. From concentrate with added ingredients. 100% real fruit juice. Now in pouches! No sugar added. Since 1842. See side panel for nutrition information. 100% DV vitamin C per pouch. 110 calories per pouch. Let's Play. letsplay.com. Non GMO (Non-GMO/GE. Certified by NSF. www.nsfnongmo.org). Good choices come in all sizes. Try all our flavors. No artificial flavors, colors or sweeteners. 1-1/2 servings of fruit per pouch (Provides 1-1/2 servings of fruit per pouch. Current USDA dietary guidelines recommend a daily intake of 2 cups of fruit for a 2,000 calorie diet. 1 serving = 1/2 cup). Gluten free. Contains 100% juice. 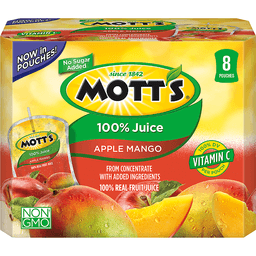 www.motts.com. Unsweetened. Pasteurized. Juice from concentrate. USDA organic. No sugar added. 110 calories per bottle. Non GMO Project verified. nongmjoproject.org. No sugar added. Pasteurized for your safety. Each 8 fl oz cup provides a 1 cup serving of fruit [Serving information based on USDA's MyPlate (www.ChooseMyPlate.gov)]. In 1961, a harvest of grapes from organic vineyards in Paradise, California, inspired R.W. Knudsen to pioneer a new tradition of bottling natural fruit juices. His commitment began with a desire to make juices of the best possible quality for his own family. 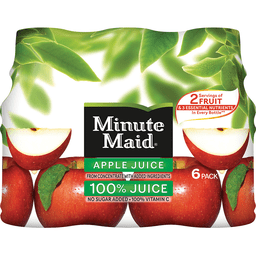 This meant making juices that were exclusively fruit juice sweetened, with no artificial flavors. Today you and your family can enjoy the R.W. Knudsen Family products made with that same commitment. Savor the refreshing goodness crafted with integrity and care - For Goodness Sake! - The Knudson Family. Natural separation may occur. Non-GMO Project verified is a registered trademark of the Non-GMO Project, Inc. Not a low calorie food. Contains 100% juice. www.rwknudsenfamily.com. Certified organic by Quality Assurance International. Glass recycles. Contains concentrate from New Zealand & Argentina. From concentrate with added ingredient. Excellent source of vitamin C. Free From: Artificial flavors; artificial colors. USDA organic. 120 calories per 8 fl oz serving. Pasteurized. Live Free with Wild Harvest: Wild Harvest is a complete selection of products that are free from more than 100 artificial preservatives, flavors, colors, sweeteners and additional undesirable ingredients. Our products are pure and simple because they're flavored and colored by nature and created to support your family's healthy and active lifestyle. People of all ages love the taste of Wild Harvest foods. To learn more about Wild Harvest products, including our full line of organic products, and for recipes, please visit www.wildharvestorganic.com. Contains 100% juice. Please recycle. Supervalu Quality Guaranteed: We're committed to your satisfaction and guarantee the quality of this product. Contact us at 1-877-932-7948, or www.supervalu-ourownbrands.com. Please have package available. 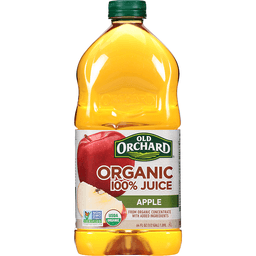 Certified organic by Quality Assurance International, Inc. Bottled in USA. Concentrate of Turkey. 10 pouches. Juice drink from concentrate. All natural ingredients. No added sugar (Not a low calorie food. See nutrition information for calorie and sugar content); artificial colors; flavors, preservatives; high fructose corn syrup. USDA organic. 60 calories per pouch. Nothing but organic goodness. 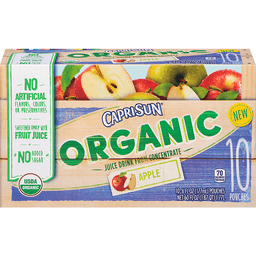 Capri Sun Organic is a USDA Certified Organic juice drink, made with yummy fruit juice from organic farms. Each pouch is bursting with flavor from all-natural ingredients and has no artificial colors, flavors or preservatives. There's no room in our pouch for anything but the best, so it's sure to put a smile on every kid's face. See the goodness inside. You only want what's best for your kids, and so do we! That's why we're committed to making Capri Sun Organic with all-natural ingredients. Everything that goes into our pouches is there to bring out the joy and excitement of childhood. In other words, it's all good. Please recycle this carton. USDA certified organic. No artificial preservatives. No added sugar (Not a low calorie food. See nutrition information for calorie and sugar content). 66% juice. Certified organic by Quality Certification Services. Sweetened only with fruit juice. Contact us at: 1-800-227-7478. Please refer to code numbers on side panel or on pouch when contacting us. 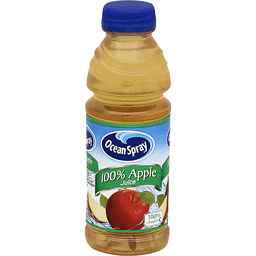 Ocean Spray® 100% Apple Juice. 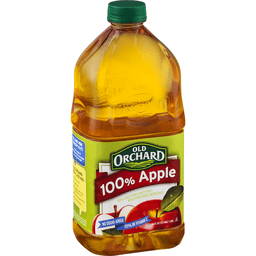 100% vitamin C. 100% apple juice from concentrate with other natural flavors and ingredients. Contains 100% juice. Please recycle. Contains concentrate from Germany, Austria, Italy, Hungary, Argentina, Chile, China, Turkey, Brazil and the United States. 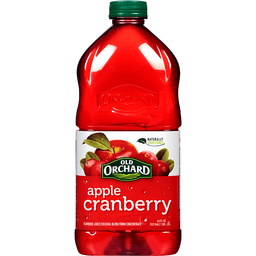 Manufactured by independent producers for PepsiCo, Inc. Purchase, NY 10577 under the authority of Ocean Spray. For comments or questions call 1-877-342-1815. www.oceanspray.com. Ocean spray is a registered trademark of Ocean Spray Cranberries, Inc.
R.W. 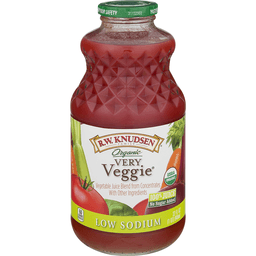 Knudsen Very Veggie Juice - Low Sodium Organic - 32 Fl oz. 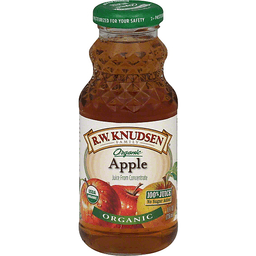 RW KNUDSEN VERY VEGGIE ORGANIC JUICE IS A REFRESHING, NUTRIENT-RICH DRINK LOADED WITH NATURAL INGREDIENTS INCLUDING SPINACH, CELERY, CARROT, BEET AND PARSLEY JUICES AS WELL AS ORGANIC LETTUCE, GREEN BELL PEPPERS AND TOMATO PASTE. EVERY 32 FL. OZ. CONTAINER IS FREE OF GMOS AND ARTIFICIAL FLAVORS AND EACH SERVING CONTAINS ONLY 50 CALORIES. Now in pouches! Since 1842. No sugar added. See side panel for nutrition information. From concentrate with added ingredients. 100% real fruit juice. Vitamin C 100% DV per pouch. Non (non-GMO/GE. Certified by NSF. www.nsfnongmo.org) GMO. 100 calories per pouch. Let's play. letsplay.com. Good choices come in all sizes. 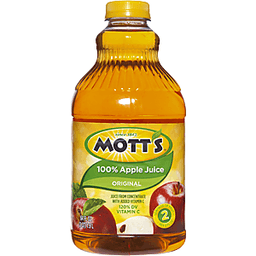 Try one of our many delicious Mott's Applesauce products your kids will love. Made from 100% real fruit. Excellent source of vitamin C. Available in a variety of flavors. Available in pouches, cups and jars for snack time, meal time and on-the-go. Try all our flavors. No artificial flavors or sweeteners. 1-1/2 servings of fruit per pouch (provides 1-1/2 servings of fruit per pouch. Current USDA Dietary Guidelines recommend a daily intake of 2 cups of fruit for a 2,000 calorie diet. 1 serving = 1/2 cup). Gluten free. Contains 100% juice. 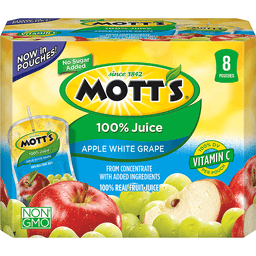 www.motts.com. Unsweetened. Pasteurized. 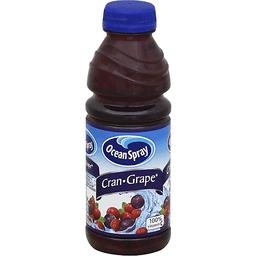 Ocean Spray® Cran Grape® Juice. 100% vitamin C. Grape cranberry juice drink blended with another juice from concentrate. Please recycle. Contains 15% juice. Pepsi Co, Inc. under the authority of Ocean Spray. Ocean Spray and Cran Grape are registered trademarks of Ocean Spray Cranberries, Inc. For comments or questions call 1-877-342-1815. www.oceanspray.com.